The TT Supporters’ Club is delighted to announce that French sidecar driver, Estelle Leblond is to be presented with the Susan Jenness Trophy for her outstanding achievements at last year’s event… 18th in Race 1 at an average speed of 105.16mph. Awarded annually for the most meritorious performance by a female competitor, the trophy is in memory of Susan, a TTSC member who lost her life whilst marshalling an off road event some years ago. Female competitors will be vying for the honour of claiming the trophy at this year’s meeting, but also up for grabs is the TT Supporters’ Club Trophy presented to the rider with the fastest aggregate time across the two Supersport Races. Despite there being two different winners last year – Gary Johnson and Michael Dunlop – Bruce Anstey was handed the trophy for his two second positions… securing it with 0,091 seconds to spare! 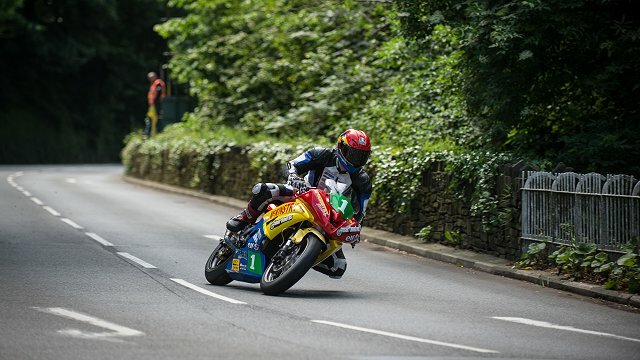 The TT Supporters’ Club has been assisting the TT competitors since its inauguration in 1973, effectively contributing over £250,000 to help them pit their skills against the Isle of Man Mountain Course. This assistance has been in the form of services – many will recall the soup tent at the early morning practice sessions – and useful goods… fire retardant overalls, fleeces, tools, duct tape and the like. 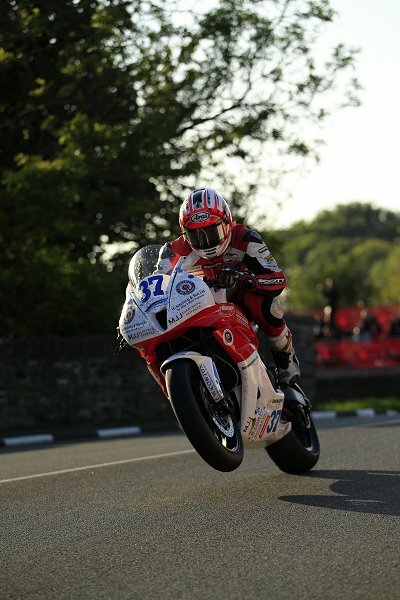 TT 2015 however, sees a change in strategy… each competitor, on the proviso that they are members of the Club, will receive a monetary award of £45 to support their racing. The TTSC is also making a substantial contribution to the cost of providing the energy drinks and gels supplied to competitors. Ivan Lintin at Braddan on his Lightweight machine; unfortunately, he retired a mile up the road at Union Mills with electrical problems.